The Hanged Man Tarot Card often symbolizes self-sacrifice. This could be either material or emotional and an ability to adapt to changing circumstances that you currently face. This tarot card can often represent a time of limbo in your life. It can also mean a small pause in you life until something or maybe even someone is given up for a much greater gain. 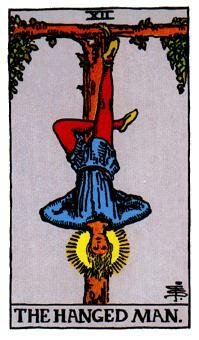 The Hanged Man Tarot Card often can represent stress, anxiety and ill health. This card shows a time for patience and acts as a reminder to not worry. This card represents a trial of passage and therefore a sign of the self-sacrifice aspect that this tarot card represents. It has deeply spiritual overtones. Negatively, The Hanged Man Tarot card commonly symbolizes selfishness. The horrible use of emotional blackmail by playing the martyr is a common theme here. Additionally, a negative aspect of this card is that a weakness of willpower and emotional strength could possibly lead you in the wrong direction. This could be both materially and/or emotionally which could potentially lead to missed opportunities. Definitely a card to watch out for!